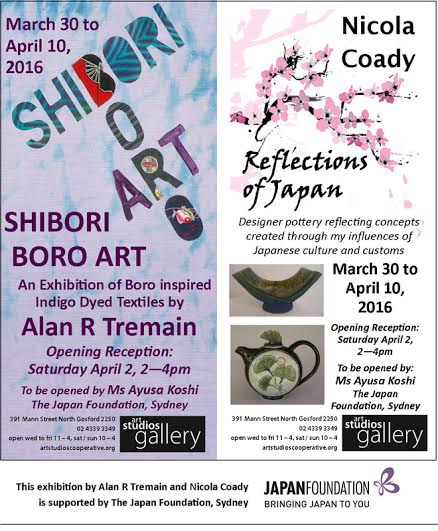 QuiltNSW member Alan Tremain's 'Shibori Boro Art' exhibition features boro inspired indigo dyed textiles, in conjunction with Nicola Coady's 'Reflections of Japan' designer pottery. 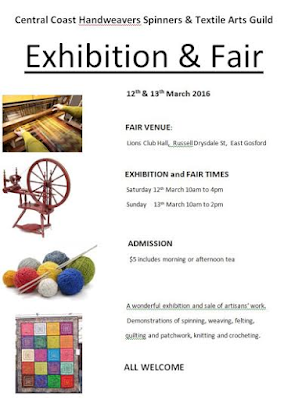 Alan has designed and created an exhibition of original textiles which includes layered bed cloths, interior décor textiles and limited fashion accessories. Nicola's designer pottery reflects concepts created through her influences of Japanese culture and custom. After retirement from work and a busy life in Sydney, Jann Sturdy moved to Anna Bay. Jann found that once she had settled in to a much quieter lifestyle, she had to find something to do to keep herself busy and interested. Jann was always interested in sewing and decided that patchwork and quilting could be that something and so her journey began. 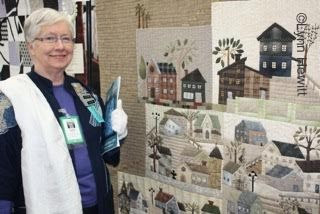 Her quilts are mostly machine applique, although she has made pieced quilts. Jann loves Michele Hill's 'William Morris' designs and has actually made 14 of her quilts. 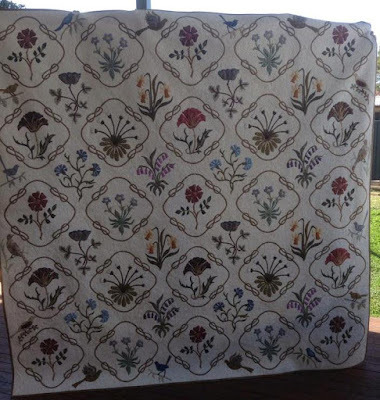 Jann is a beautiful domestic machine quilter and has taught many quilting classes to keen students, endeavouring to pass her free-motion quilting knowledge and skills on to others. We are sure to be treated to some lovely work. 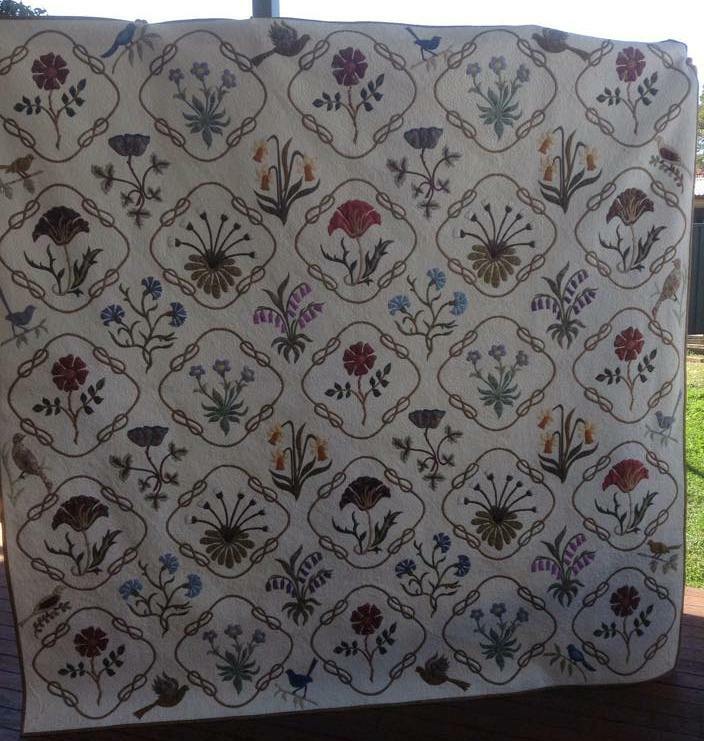 Above 'Kelmscott' a Michele Hill design made and quilted by Jann Sturdy. Deadline for Sydney Quilt Show Entries. Have you got your quilts ready? 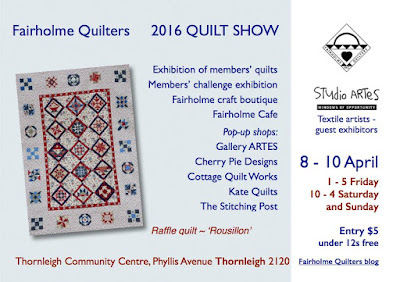 Guest Demonstrator : Julie Woods "Julies Superior Threads"
Guest Speaker : Lynn Hewitt "Tales of a Textile Traveller"
All Members, Quilters and Friends are invited to attend the 2016 Country General Meeting of Quilt NSW, held in conjunction with Southern Highlands Quilters. The in-house Cafeteria offers a range of full meals, and there is a cafe for the 'coffee and cake' brigade. Our Guest Speaker is the delightful and well known Quilter and Teacher, Lynn Hewitt. A respected and stalwart member of QuiltNSW for many years, Lynn is going to regale us with stories from the many Quilt Themed International Tours that she has led. Please bring Show and Tell with you. As an Artist, what could be better than having the ability to construct the very canvas upon which you work. The bringing together of disparate collected materials, laying them out together on the floor, touching them and remembering their histories. Where they were found. Their previous purposes. Innate meanings which pieces of fabric contain. This one too white, so tea dyed. This one too vibrant, so turned over to the wrong side. A piece from an old suit, or wedding dress. A quilt becomes a collage of collected histories, layers of narrative beneath the meaning or message in the obvious -o -so right side together- pieced surface pattern or design. Then comes the stitching, the repetitive movement of the hand. The hand of the artist moving through lines of stitch over time to complete the quilt, layers lashed together and containing much more than can be appreciated at first glance. My quilts have variously been described as ‘out of the box’ and ‘left of centre’ and ‘unique’. I believe this is because of several factors which have led me to approach my quiltmaking practice differently. My background is firmly based in art and design. I studied design at the college of fine arts in the late 90s and have since also gained an art education degree. I love teaching high school level art and am constantly researching artists and finding ways to reflect this interest in my quilts. I have a love of ‘play’ when it comes to working with fabric. A hands on ‘what if’ approach helps me to push my design process and create works which are unique, original and deeply personal. I may begin with an existing design, either an old or new quilt or idea from the world around me. This changes as the idea is refined in the design process. The third factor which has had a lasting impact on my quiltmaking was my work during the early part of my career with Australian fashion designer Akira Isogawa. Practical experience with such a talent has had a lasting impact on my design aesthetic from the sourcing of materials to a ‘collage’ approach. 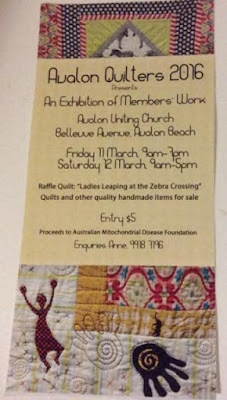 Jessica has exhibited her quilts locally including the Hunters Hill Quilt Show, the Sydney Quilt Show, as well as last years "Evolution, Change, Challenge: A Contemporary Quilt Exhibition" and many others. Her work interprets traditional quiltmaking into a contemporary aesthetic. Her quilt shown below won her a ribbon at the 2014 Sydney Quilt show for 'Best Quilt inspired by an Antique Quilt'. All welcome. So come along for an enjoyable morning.